Uncle Sam will be happy to hear that more than half of Americans believe it is easier to figure out their income taxes than to figure out what they should and shouldn't eat to be healthier, according to the 2012 Food and Health Survey: Consumer Attitudes toward Food Safety, Nutrition & Health. Commissioned by the International Food Information Council (IFIC) Foundation (www.foodinsight.org), this web-based survey of 1,057 Americans ages 18 to 80 was fielded in April and is the seventh annual national IFIC study designed to gain consumer insights on food safety, nutrition, and health-related topics. Nearly all respondents give at least a little thought to the healthfulness of their diet (and are trying to improve at least one of their eating habits), physical activity and the safety of their food. But media reports are constantly highlighting concern over the "obesity epidemic," and seemingly contradictory news stories tout and condemn various nutrients. So many consumers acknowledge it can be hard to know what to believe about ever-changing nutrition information. Only 71 percent would even hazard a guess at the number of calories they need to maintain their weight, and two-thirds of them estimated incorrectly. Only 15 percent accurately estimated. Some 52 percent are unable to estimate how many calories they burn in a day (19 percent say 1,000 calories or less), and only 30 percent correctly believe that all sources of calories play an equal role in weight gain. Twenty percent believe calories from sugars are most likely to cause weight gain (a significant increase from 11 percent in 2011) while 19 percent believe that calories from carbohydrates are most likely to cause weight gain, and 18 percent believe the culprit is calories from fats. Most-often used packaging information includes the expiration date (76 percent) and the Nutrition Facts panel (66 percent) -- both consistently have been at the top of information consumers seek from food packages. This year, the expiration date jumped significantly from 2011 (63 percent) to overtake the Nutrition Facts panel. Half of consumers look at the ingredients list, the serving size and amount per container plus calorie or nutrition information icons displayed on the front of the package. Over the past 12 months, 51 percent say they tried to limit or avoid sugars. While 44 percent are trying to limit or avoid high-fructose corn syrup (HFCS), a similar number (45 percent) say they don't pay attention to HFCS. And most do not pay attention to complex (60 percent) or refined (62 percent) carbohydrates when making packaged food or beverage decisions. When deciding what packaged foods or beverages to buy, 71 percent consider calories, 67 percent choose whole grains, 62 percent look for fiber, followed by sugars in general (60 percent), sodium/salt (60 percent) and fats/oils (60 percent). Whom do they trust? Seventy-six percent feel that changes in nutritional guidance make it hard to know what to believe. When asked how they determine whether to believe new information about food and health, respondents say they follow up and do their own research before they believe it (26 percent), judge information based on the source and if it is from an organization they trust (24 percent) or simply use their own judgment and will not believe it if it seems too good to be true (14 percent). More than 85 percent admit to giving some thought to the safety of their foods and beverages over the past year, and 78 percent are very or somewhat confident in the safety of the U.S. food supply. Only 17 percent report they have stopped buying a specific brand or type of food due to safety concerns. However, things that do have an impact on their purchasing decisions include bacteria (51 percent), "chemicals" in food (51 percent), imported food (49 percent), pesticides (47 percent), animal antibiotics (30 percent) and undeclared allergens (25 percent). Americans think the person who prepares most of the food in their home does the best job of ensuring the safety of their food (94 percent), 82 percent say farmers/producers are doing a good job or better and 73 percent cite retailers. But don't get too comfortable, as food manufacturers (65 percent), foodservice establishments (64 percent) and the government (56 percent) rank lower. All entities charged with ensuring the safety of the U.S. food supply are viewed as doing at least a good job. Similar to past years, taste (87 percent) and price (73 percent) continue to drive food and beverage choices more than healthfulness (61 percent), convenience (53 percent) or sustainability (35 percent). While respondents acknowledge they are trying to improve the healthfulness of their diet, 54 percent say they would rather just enjoy their food than worry too much about what's in it. Overall Health Status: Nine out of 10 respondents describe their health as good or better, a significant increase from previous years. The majority (60 percent) says their health is either excellent or very good, and only nine percent report that they are in fair or poor health. Despite their belief that they are in good health, many recognize there is room to improve their diet, with only about a quarter reporting that their diet is either extremely or very healthful and about 21 percent reporting their diet is not at all or not too healthful. Nearly all say they are trying to improve at least one aspect of their eating habits, and 87 percent try to eat more fruits and vegetables. Weight Management: More than half (55 percent) say they are trying to lose weight, significantly up from 43 percent in 2011; however, the number does seem to return to historical norms (54 percent in 2010, 53 percent in 2009, 57 percent in 2008 and 56 percent in 2007). While 22 percent are trying to maintain their weight, only 20 percent report they are not doing anything regarding their weight. These numbers have remained fairly consistent for the past few years of the Survey. Calories and Energy Balance: While the majority (71 percent) estimate the number of calories they need to maintain their weight, 64 percent of them estimated incorrectly with nearly half (49 percent) under estimating. Only 15 percent were accurate. Some 52 percent are unable to provide an estimate of how many calories they burn in a day, or offer inaccurate estimates (19 percent say 1,000 calories or less). And when it comes to calories, only 30 percent correctly believe that all sources of calories play an equal role in weight gain. Twenty percent believe calories from sugars are most likely to cause weight gain, a significant increase from 11 percent in 2011, while 19 percent believe that calories from carbohydrates are most likely to cause weight gain, and 18 percent believe it is calories from fats. Physical Activity: Although respondents are evenly split on what is harder to do well between consistently eating a healthful diet (52 percent) and consistently being physically active for at least 30 minutes a day for five days per week (48 percent), the majority report being at least moderately active. It is notable that men are more likely than women to report finding it easier to be consistently physically active than to consistently eat a healthful diet. The vast majority (94 percent) of respondents have given at least a little thought to the amount of physical activity they get, with 61 percent saying they have given a lot of thought to the issue. Two out of three consider themselves active, though only 11 percent consider themselves to be vigorously active. While physical activity levels have remained relatively steady; fewer Americans (34 percent) consider themselves to be sedentary. Among those who are active, half report they include strength training in their physical activity regimens. Similar to last year, a large majority (77 percent) does not meet the U.S. Department of Health and Human Services' Physical Activity Guidelines. Sustainability: Two-thirds report they have given some thought to whether foods and beverages they purchase or consume are produced in a sustainable way. When asked what actions they purposely take on a regular basis, about 41 percent say they purchase foods and beverages that are advertised as "local," 39 percent report they buy "foods and beverages at farmers markets," and 38 percent purchase "foods and beverages in recycled and/or recyclable packaging." Dietary Fats: Two of three respondents (67 percent) say they try to eat as little fat as possible, even though a large majority understands that different fats can have different impacts on health. Only 22 percent believe all fats have the same impact on health, yet many are limiting or avoiding several types of fats. While 49 percent say they are trying to avoid trans fat, 32 percent also say they are trying to limit the more healthful mono- and poly-unsaturated fats. Lowering fat intake is compelling to Americans; 75 percent say they choose products that are lower in total fat at least sometimes. Weight and health considerations, specifically reducing the risk of heart disease, are the main reasons for monitoring fat content in food and beverage products. Sodium: Six of 10 consider the sodium content of packaged foods -- almost always due to a desire to limit or avoid it entirely. Seventy-eight percent have taken at least one of six specified actions to limit their sodium consumption, with "limiting the amount of salt I add to my food" being the most cited action. The large majority (81 percent) says they have normal blood pressure although; nearly one in four (23 percent) indicate this is achieved with the help of medication. As one would expect, the share that use medication to maintain a normal blood pressure rises with age. For the 33 percent who say they have high blood pressure or normal blood pressure with medication, the top control strategies are medication (79 percent), attempts to lose weight (68 percent), and reduction of sodium or salt intake (65 percent). For the 63 percent whose blood pressure is in the normal or low range without the use of medication, almost half (48 percent) have taken actions to keep it so, such as reducing sodium or salt intake (29 percent), attempts to lose weight (27 percent), and increasing the type or level of physical activity. Of those Americans who are making an effort to manage their blood pressure, regardless of their blood pressure status, the majority is doing so in an effort to take more responsibility for their health. One in four (26 percent) are making efforts to manage blood pressure because they have read or heard that they should. Fifty-seven percent of those who have high blood pressure or normal blood pressure with the help of medication report they are making an effort to manage their blood pressure due to a doctor's directive. Carbohydrates & Sugars: When making packaged food or beverage decisions over the past 12 months, 51 percent say they tried to limit or avoid sugars. While more than 4 in 10 (44 percent) indicate they are trying to limit or avoid high fructose corn syrup (HFCS), a similar number (45 percent) say they don't pay attention to HFCS. The majority doesn't pay attention to complex (60 percent) or refined (62 percent) carbohydrates when making packaged food or beverage decisions. Weight management (62 percent) and preventing a future health condition (54 percent) are the most common reasons for considering sugars or carbohydrates when making purchasing decisions. Additionally, among those who pay attention to carbohydrates and sugars content, almost half (47 percent) choose products based on the type of sweetener. Most believe that sugars can be included in a healthful diet. A little more than six in 10 agree that moderate amounts of sugar can be part of an overall healthful diet (62 percent) and that it is not necessary to completely eliminate sugar from your diet in order to lose weight (61 percent). Additionally, 43 percent agree that people with diabetes can include some foods with sugar as part of their total diet. All three responses were significantly higher than in 2011. Low-Calorie Sweeteners: Almost half (46 percent) of consumers consider whether or not the packaged foods or beverages they purchase contain low-calorie sweeteners. Of those who report that they are consuming low-calorie sweeteners (30 percent), either actively or passively, the majority of respondents (73 percent) say the reason they do so is for calorie control. An increasing percentage (41 percent) agree this year that low-calorie sweeteners can reduce the calorie content of foods and are an option for people with diabetes. In addition, four in 10 acknowledge the role low-calorie sweeteners can play in weight management, and one-third agree that they can be part of an overall healthful diet, both significant increases from 2011, but similar to levels seen in earlier surveys. Protein: Nearly six of 10 consider protein when making a decision about buying packaged food or beverages, and the majority is trying to consume more. Americans understand the varied benefits of protein, with 88 percent recognizing that it helps build muscle, 80 percent believe it is part of a balanced diet, 60 percent agree it helps people feel full, and 60 percent indicate a high protein diet can help with weight loss. While 84 percent believe that it is easy to incorporate protein into their diet, a quarter also believe these foods are too expensive to consume as much as they would like. More consumers (47 percent) try to eat protein during an evening meal than during other meals or snacks; however, more than half (52 percent) simply try to get enough protein over the course of the day or week rather than focus on specific meal times. They believe that higher amounts of protein are especially beneficial for athletes (80 percent) and teens (66 percent) than children under 12 (51 percent) and people aged 55 or older (46 percent). Food Additives and Colors: When it comes to functions food additives and colors serve in foods, 68 percent agree that food additives extend the freshness of certain foods. Four in 10 also understand that food colors contribute to the appeal of food, a significant increase from 29 percent in 2011. More than half (56 percent) understand that both natural and artificial food colors must be labeled on food packages, and in terms of the regulation of food additives and colors, 60 percent recognize that the FDA regulates the use of food additives. In addition, almost half of consumers agree that food colors must be reviewed and approved by the U.S. government before being added to foods (46 percent), which has remained constant since 2010. However, only about one-third realize that the FDA sets allowable daily intakes for food additives and that non-government scientists and experts are involved in the review process of food additives before they are approved by the FDA. Food Safety: More than 85 percent admit to giving some thought to the safety of their foods and beverages over the past year, and 78 percent are very or somewhat confident in the safety of the U.S. food supply. Nearly six of 10 (57 percent) agree that the chances they will actually get foodborne illness or food poisoning (like Salmonella or E.coli) from something they eat or drink are extremely low. Only 17 percent report that they have stopped buying a specific brand or type of food due to concerns about its safety; however, concerns about bacteria (51 percent), "chemicals" in food (51 percent), imported food (49 percent), pesticides (47 percent), animal antibiotics (30 percent) and undeclared allergens (25 percent) do have an impact on what foods or brands they purchase. Americans perceive the person who prepares most of the food in their home to do the best job of ensuring the safety of their food (94 percent). Eighty-two percent say farmers/producers are doing a good job or better and 73 percent cite retailers. 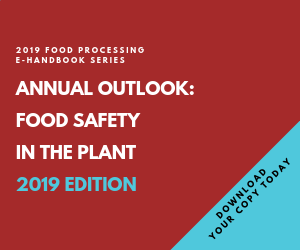 While food manufacturers (65 percent), and foodservice establishments 64 percent) and the government (56 percent) rank lower, all entities charged with ensuring the safety of the U.S. food supply are viewed as doing at least a good job. About half (48 percent) feel that imported foods are less safe than foods produced in the U.S. Most of those (77 percent) attribute that to a lack of regulation. In fact, 61 percent believe imported foods are produced in less sanitary conditions, and 60 percent believe they could become contaminated or spoiled during travel to get to the U.S.
Information Sources and Influences: Three of four consumers (76 percent) feel that changes in nutritional guidance make it hard to know what to believe. When asked how they determine whether to believe new information about food and health, respondents follow up and do their own research before they believe it (26 percent), judge information based on the source and if it is from an organization they trust (24 percent), and will simply use their own judgment and will not believe it if it seems too good to be true (14 percent). Nearly six in ten (57 percent) believe that online and mobile tools can help them live healthier lifestyles. Respondents find the MyPlate graphic to be effective in conveying the desired messages of the Dietary Guidelines for Americans: People should eat a variety of food groups for a balanced diet (95 percent); people should eat a healthful diet (91 percent); healthful foods are found in each of the five food groups (82 percent); people should have dairy with their meals (78 percent); and people should make half their meals fruits and vegetables (75 percent). Purchasing Influences: Similar to past years, taste (87 percent) and price (73 percent) continue to drive food and beverage choices more than healthfulness (61 percent), convenience (53 percent) or sustainability (35 percent). While there was a significant decrease in the number of Americans who reported that price (79 percent), taste (66 percent) and sustainability (58 percent) had an impact on their purchasing decisions from 2011, the numbers appear to have returned to historical norms (except sustainability, which was new in 2011 and for which the norm will become clearer in future surveys). Older Americans are more likely than those who are younger to report that healthfulness, taste and sustainability impact their food selection, while price is more important for consumers younger than 50 years of age. Family Health: Nearly nine in 10 parents believe that it is good for their health to sit down and eat meals with their family, with 57 percent strongly agreeing to that point, and two-thirds of parents worry more about the healthfulness of their children's diets than their own.